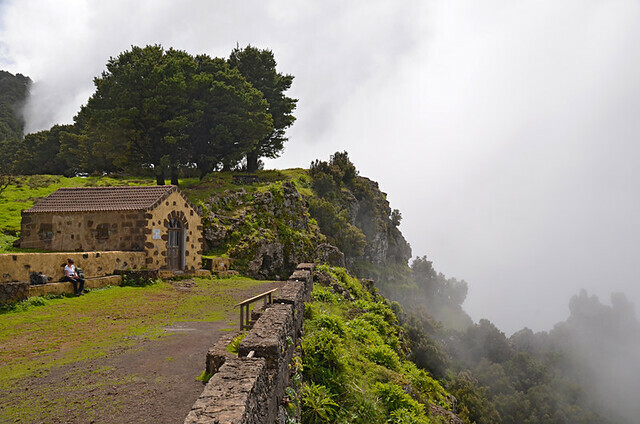 Last time we visited El Hierro some of its charm had seeped away for us. The previously magical diminutive Canary Island stuck out in the Atlantic had seemed ordinary and, wearing a dusty brown height-of-summer coat, not particularly attractive looking. Island hopping to La Palma a few days later only heightened that view as much of La Isla Bonita was still gloriously green. So it was with diluted enthusiasm we returned to research new walking routes across the island at a time when winter was handing the seasonal baton to spring. 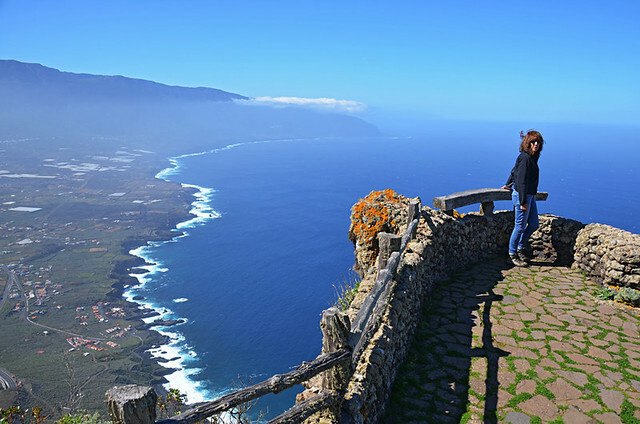 Maybe the mythical charm had been on its summer holidays during our last visit, but within a couple of hours of touching down, we’d succumbed to El Hierro’s friendly embrace once again. Last trip we’d packed in three hotel stays in as many nights so there was a disjointed element to our visit. This time we had eight days to really get to know the island by walking across it, with our base being in Frontera for most of the week. 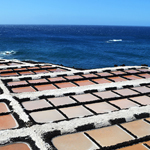 These are a selection of the ingredients which were responsible for re-kindling the El Hierro love. 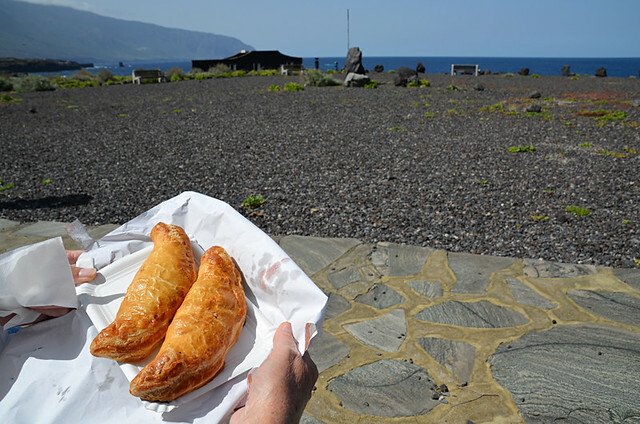 For all its qualities, gastronomy isn’t one of El Hierro’s strongest features. But there are signs the gastronomy game is being upped. A belly-busting Saturday night in tiny Guachinche Frontera (Calle Carrera 1; open 1230 -2330 Tuesday to Sunday, closed Monday) was a culinary experience which will linger long in the memory banks. 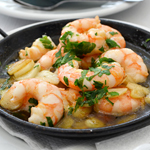 Guachinche Frontera has Catalonian owners with personalities as big as the portions they serve, and that’s saying something. Pre-meal entertainment involved Chef David showing us a monster of an old oven in a smoke-filled kitchen whilst a man wearing a pink wig and matching tutu sipped wine at the restaurant’s bar. 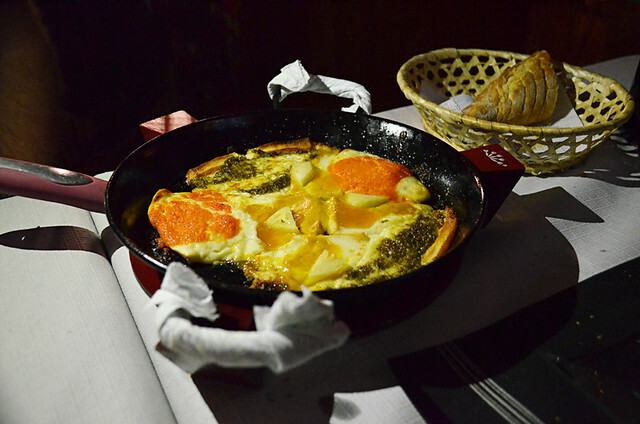 The food was equally colourful; a Canarian dish of grilled cheese with mojos (spicy salsas) was given the Catalan touch with fresh herbs and fruit elevating it to a new level. Cheesy caramelised fried aubergines were unlike any we’d eaten before. After two starters three of us were stuffed. 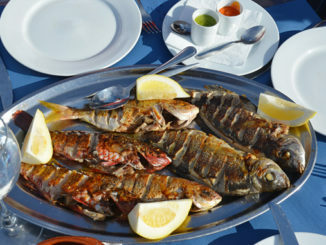 Main courses consisted of an army troop-sized pan of beans, rice, chorizo, chicken and just about any other ingredient you can think of as well as a “poquitito” (small) plate of peto (four big wahoo fillets) accompanied by seafood fideo. They’re used to people asking for doggy bags, what was left of our main courses was enough for a generous re-match the following night. Last time we ate at Don Din Dos (Calle La Corredera 5; open 1100- 2300 daily), the more you say it the sillier it sounds, the food was decent but conventionally traditional. The menu listings suggested more of the same; however, the owner’s creative chef son had a few surprises up the sleeve of his whites. 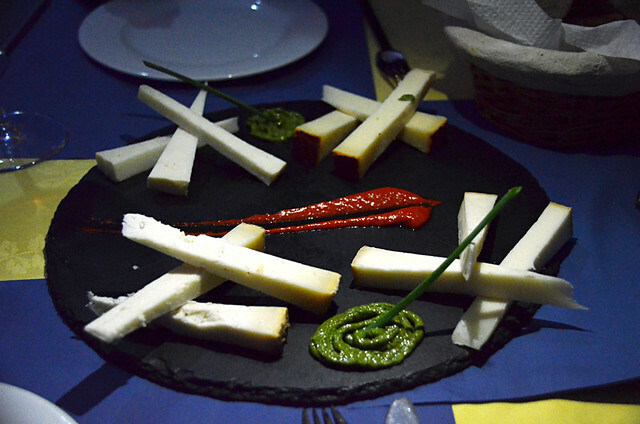 Local cheeses were imaginatively presented on a circular slate whilst cheese croquetas were completely re-invented thanks to the addition of a light strawberry sauce boosted by slivers of lemon zest. All in all a departure from the norm and a pleasant surprise. Even the local pastelería, Mi Abuelo José (Avenida Ignacio Padron, Tigaday) wasn’t a typical Canarian cake and pastry shop. The South American influence is strong in Frontera, meaning you get tasty savoury pies which aren’t of the nine tenths pastry, one tenth hot dog variety. 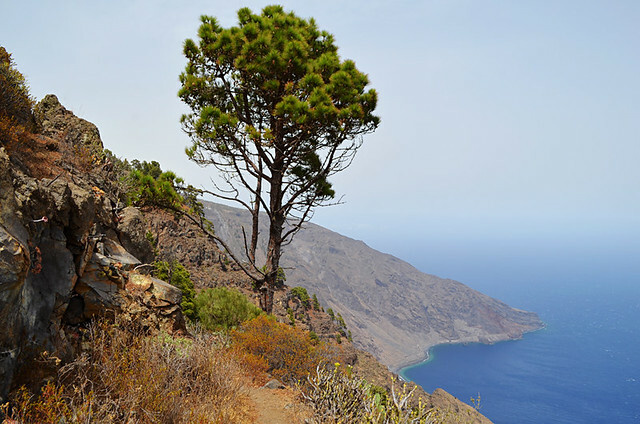 Anybody who’s experienced any of El Hierro’s trails, beautifully marked by Italian walking guide and all round nice guy Paulo, will already know just how enjoyable and people-free the island’s paths are as well as the surprisingly diverse landscapes you encounter on such a small island. 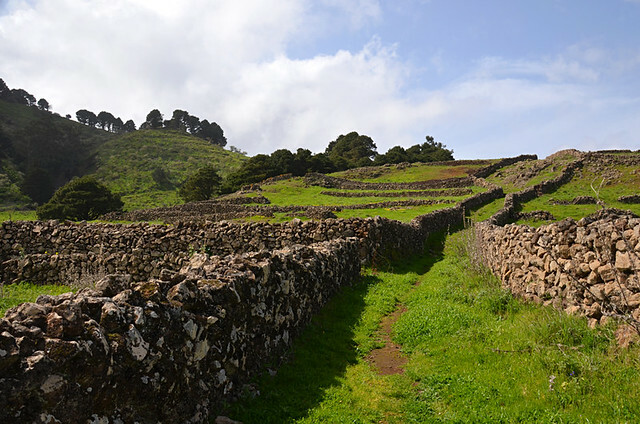 There were a few routes which stood out for us and which were instantly added to our list of Canary Island favourites. One of these was crossing the Meseta de Nisdafe, the flattish plateau which crowns the island. It’s a place which messes with the mind. On the one hand, the dry stone dykes, wild flowers, neat fields, voluptuous trees and woolly sheep look more Dales than Canary Island. Then you hear unnerving hollow footsteps as you cross coiled volcanic surfaces between walls and you’re reminded this is a relatively young volcanic world you’re exploring. On one route through Nisdafe’s ‘Little Britain’ we passed only one other walker, appropriately a Yorkshireman. Enjoying a picnic at Mirador de Jinama with cloud swirling just below our feet made it feel as though not only were we at the end of the world, we were also on top of it. The fact cloud obscured the views didn’t detract, we’d already enjoyed El Golfo Valley vistas from Mirador de la Peña a few hundred metres in altitude below us. Sitting in sunshine, with misty wisps making the nearby branch arch start to the steep descent to Frontera seem more like a portal to a strange dimension, added to an other worldly atmosphere. Herreños used to bring livestock up and down the old path, quite some feat as it’s challenging enough wearing sturdy boots with glue-like grips. Topping them all is a circular route from Sabinosa which takes in foggy American Werewolf in London type scenes where moss drips from signposts; sunny avenues lined by trees with bushy canopies; a half collapsed viewing platform way above El Golfo, and the pretty sanctuary of Nuestra Señora de los Reyes from which every four years the ‘virgen‘ is carried on a pilgrimage to Valverde, the island’s capital. The sanctuary was the place we encountered most people on a walking route, only because they were able to drive to it. Even then there were only a handful, none of whom made it the couple of hundred metres to the even more interesting Cueva del Caracol. 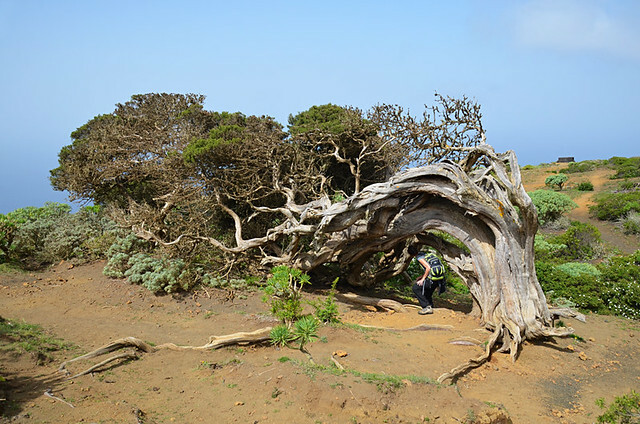 The highlight of the route, and our favourite spot on El Hierro, is the Sabina forest or, if your imagination is as wild as the wayward branches on the gnarled trees, a coven of petrified witches. 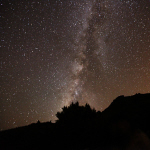 Whatever the reality, we’ve once again been put under El Hierro’s spell.